We have established a deep wound infection model in mice (validation in rats is available upon request). A biopsy punch is used to create a full-thickness 6 mm wound over the thoracic spine area on the dorsal surface and bacterial broth is inoculated directly into the wound. Test article may be administered via topical application, oral gavage (PO), subcutaneous (SC), intraperitoneal (IP), or intravenous (IV) injection. Each study parameter (animal strain, pathogen, comparator(s), and dosing schedule) can be customized to meet client needs. 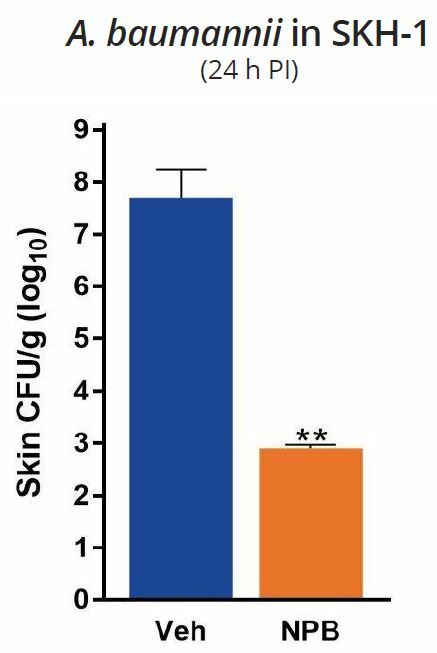 Endpoints for this study include CFU burden in harvested skin. Pharmacokinetic profiling, blood chemistry, additional tissue harvests, and histology are available upon request.